This book is like no other nutrition book written. The concepts and methodology I have written about you will not find in other books. This is not a DIET program, it is far from it. It is about how we are all interconnected to the this planet and how food is the driving force of our existence. I teach you how to eat, when to eat, what to eat, why you need to eat. There is so much information packed into 216 pages. 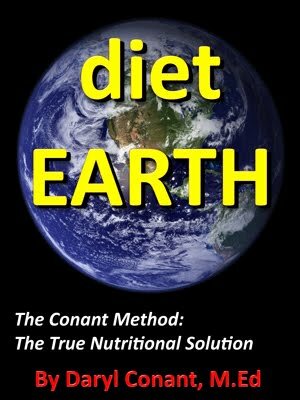 After you read diet EARTH you will have a greater understanding of nutrition. This is not the end all be all to nutrition books. It is, however, my contribution to this planet. I am excited about this book and have worked hard in giving you my best. I hope you enjoy it. The first shipment of books will be arriving sometime next week. You can pre-order a copy today. PRE-ORDER .You can go to www.darylconant.com to order. Thank you all for your support. I truly appreciate it.